ST. PETERSBURG, FL — Today, the National Center for Transgender Equality and Equality Florida released Florida-specific data from the 2015 U.S. Transgender Survey (USTS). The data revealed disturbing discrimination trends and a range of disparities between transgender people and the general population of the United States in all areas of life. As the largest survey of transgender people ever conducted, the full report includes critical information on the experiences of nearly 28,000 transgender Americans from all 50 states, the District of Columbia, American Samoa, Guam, Puerto Rico and several U.S. military bases overseas. 50% of those who were out or perceived as transgender in K–12 were verbally harassed, 23% were physically attacked, and 15% were sexually assaulted in K–12 because of being transgender. 32% of respondents who experienced homelessness in the past year avoided staying in a shelter because they feared being mistreated as a transgender person. 55% of respondents avoided using a public restroom in the past year because they were afraid of confrontations or other problems they might experience. “It remains painfully clear that transgender Floridians continue to experience overt discrimination in all aspects of their lives for simply living their true gender identity,” said Gina Duncan, Equality Florida’s Director of Transgender Equality. “While slight progress has been made in some areas of society, transgender Floridians remain a marginalized and stigmatized community." "From elementary school to joining the workplace, transgender people face alarming challenges impacting their daily lives. This survey data clearly shows that our school board members, our city and county officials and our state legislature need to move forward in creating an inclusive environment where all Floridians are treated equally under the law. This data clearly speaks to the need to pass the Competitive Workforce Act, Florida’s statewide nondiscrimination law. When they go low, we will go local," added Duncan. The full national survey report and all state breakout reports can be found at www.ustranssurvey.org. The National Center for Transgender Equality is the nation’s leading social justice advocacy organization winning life-saving change for transgender people. ​Equality Florida Institute is the largest civil rights organization dedicated to securing full equality for Florida's lesbian, gay, bisexual and transgender community. 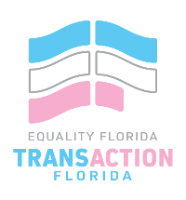 TransAction Florida is Equality Florida's transgender inclusion initiative which seeks to increase awareness, advocacy, education and equality of Florida's transgender community.